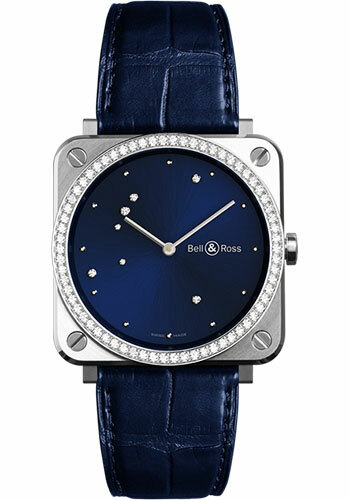 39 mm steel case with satin-polished, steel bezel with white diamonds, sapphire crystal with anti-reflective coating, midnight blue dial with hour circle featuring metal appliqués. aquila constellation represented by 7 diamonds, calibre br-cal.102 quartz movement with hours and minutes, midnight blue alligator strap, satin-polished steel pin buckle. Water resistant to 100 meters.